The Prescott Side Table is an ideal end table for any room in the house, or any area outside! This side table is a perfect addition next to any seating you may already own, giving you a handy place to set drinks, books, or any other number of items. A second shelf below the tabletop serves as a great storage area. Its sleek, clean design will coordinate well with a wide variety of styles of furniture or decor you may already own. Built out of high quality aluminum finished with a durable powder-coating this side table is both lightweight and rust-free. The PEX-864-T outdoor side table from CorLiving welcomes back the days of Mission design, which was popularized in the Southwest during the early 20th century. The contemporary approach to this classic aesthetic is what sets this stylish outdoor side table_x000D_ apart. From the clean lines to the emphasis on showcasing the wood grain. 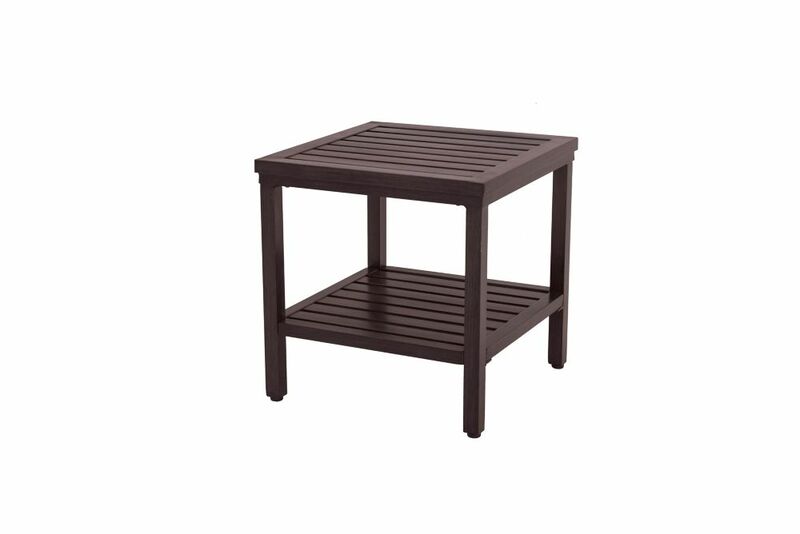 Treated to withstand the elements, this hardwood table is perfect for holding food and drinks as you socialize outside. Pine Ridge Patio Side Table The Prescott Side Table is an ideal end table for any room in the house, or any area outside! This side table is a perfect addition next to any seating you may already own, giving you a handy place to set drinks, books, or any other number of items. A second shelf below the tabletop serves as a great storage area. Its sleek, clean design will coordinate well with a wide variety of styles of furniture or decor you may already own. Built out of high quality aluminum finished with a durable powder-coating this side table is both lightweight and rust-free.